Back from breakfast out and not wearing our bee jackets we decided to give Annabelle’s unoccupied area a quick peek before starting our day. The chamber looked largely unoccupied and the syrup baggie unchanged in volume. But there seemed a little movement under the follower board. As we watched some small hive beetles crawled out and back under, exploring and being repulsed by the light. We started crushing them with the ends of the top-bars we had removed. The thumping caused some bees to investigate and they promptly began chasing the beetles. The bad news is that we saw about a score of beetles, a disturbing number. The good news (besides our killing that score of beetles) is that the bees are actively going after them. The girls can not really do much damage to the little armored fiends but it may suffice to keep them contained. We did see one bee manage to pick up a beetle and carry it off away from the hive. Soon we shall have to suit up and check the comb for damage. With the lack of rain (and hence scarcity of nectar) we have been feeding the bees a little. Mid-month they each got under a pint of syrup. Those baggies have been empty and quite flat for a while so this morning we traipsed out with two fresh baggies of a pint and a half each. Opening Beatrix’s unoccupied area we saw just a few sleepy bees wandering about. The baggie exchange itself and closing up went smoothly. The only problem arose from having placed the new baggies on a flat scrap of wood while we removed the plywood roof. The scrap was the ‘Live Bees’ label from the package cage. It still has staples in it and the point of one pricked a hole near the bottom edge of Beatrix’s baggie. Placing it in the hive we saw a steady drip that would just make a puddle so after a dash to the house and back for another baggie, we transferred the syrup and carried on without further event. And so to Annabelle. Removing the roof we spotted a few little black bodies diving away from the light down a slight open crack in front of the follower board. Damnable small hive beetles! Quickly opening up the unoccupied area of the hive we saw a spider, two wax moth, and collected under the old syrup baggie a dozen or so more small hive beetles. There were also a handful of active bees that seemed unhappy about these neighbors. We were not prepared for anything more than a quick exchange of syrup baggies, having come without our basket of tools and bee jackets, so we used the end of a top bar to swiftly crush the non-honeybee life. We then continued with the baggie exchange, closed up, and retreated to the house to decide how to address the small hive beetle problem. These pests enter a hive, lay eggs in the comb, whereupon the hatched larvae move about eating the honey and pollen, defecating in the comb, ruining the honey, and making an unholy mess. They can devastate things to the point that the bees will abscond to try their luck elsewhere. The best defense is a strong colony, which Annabelle seems to be even though she has been under stress from the hot weather. A strong colony can keep invading beetles corralled (as ours seemed to be doing) and prevent them from laying. 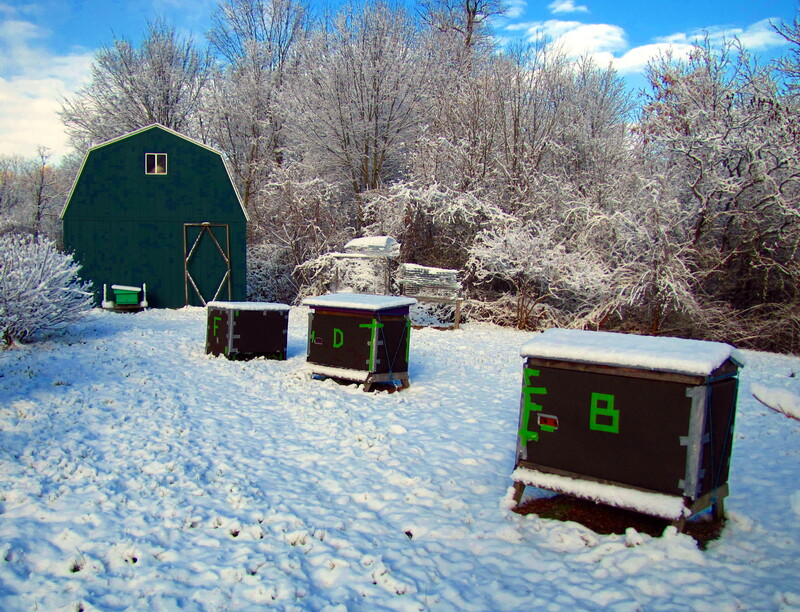 Otherwise there are a variety of beetle traps, although most are designed for Langstroth hives.